“Wer liefert was”, Europe’s leading B2B marketplace, has been acquired by the Swiss private equity firm Capvis, who have considerable experience and success in promoting the growth of leading medium-sized companies. Following the acquisition, the company intends to further expand the product portfolio and to accelerate the internationalization of the B2B marketplace. 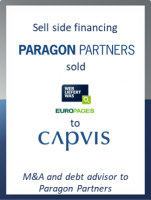 Together with the existing “Wer liefert was” management, Capvis is acquiring the company from the previous majority owner Paragon Partners. The parties agreed not to disclose the financial details of the transaction and its completion is subject to antitrust and customary regulatory approvals. Since August 2016, “Wer liefert was” has been working towards becoming Europe’s largest B2B network alongside its sister company EUROPAGES. There are currently 2.5 million suppliers with 5.5 million B2B products in 26 languages on both platforms, which are visited by 3.4 million unique monthly users and generate an annual turnover of 45 million euros. Peter F. Schmid, CEO of “Wer liefert was”, welcomes the involvement of the new investor: “We thank Paragon Partners for their entrepreneurial support in recent years but are delighted to be able to push ahead with our growth strategy together with Capvis. This allows us to further develop our position as the leading B2B marketplace in Europe and greatly expand our product range for SMEs.” The contract was signed on 31 January 2017, with the closing of the transaction scheduled for mid-March. The holding companies Paragon Partners and Nordic Mezzanine had acquired “Wer liefert was” in February 2012. As part of their successful partnership, the focus was mainly on developing the B2B product marketplace. In addition, the purchase of EUROPAGES in 2016 created the basis on which to digitize Europe’s B2B market and to continue the internationalization of “Wer liefert was” beyond the borders of the DACH region. “The last five years have been marked by a dynamic development in the B2B sector. By investing in technology and the team, “Wer liefert was” and EUROPAGES succeeded in expanding their market leadership in Europe. We thank the entire team and wish them all the best for the future,” said Dr. Krischan von Moeller, founding partner of Paragon Partners. GCA Altium acted as exclusive financial advisor to Paragon Partners on this transaction. The deal adds to GCA Altium’s extensive track record in the Internet and eCommerce space, having completed 23 transactions in this industry since 2015.